Enjoy this “Eat Dessert First” Printable that was created by Melissa at The More with Less Mom website. You will love this fun printable you can print and frame. This is one of the rules I live by. You always have enough room for dessert. I am a firm believer if you have to skip dinner to get to the dessert, then go for it. You can usually find me spying the menu for dessert before I choose my meal. I hope you enjoy this Eat Dessert First Printable as my gift to you. When you print it out, there will not be a watermark across the middle. Sign up below for my newsletter and receive recipes and baking apps, you will receive a free printable for baking substitutes. 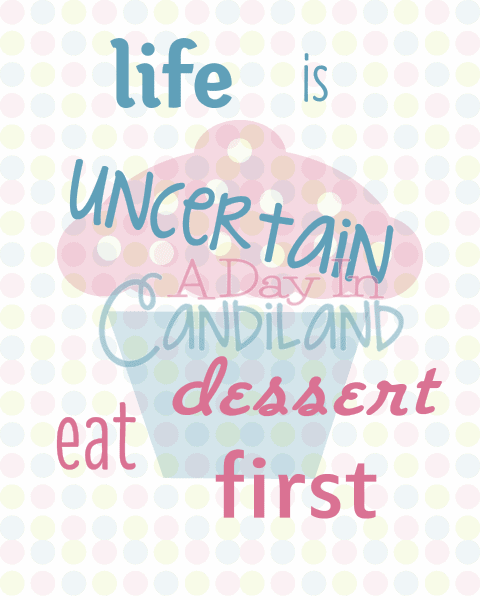 What are some of your favorite dessert quotes? Subscribe to our weekly recipes, kitchen tips and encouragement and receive this baking ingredient substitution chart for FREE! Awesome Right?